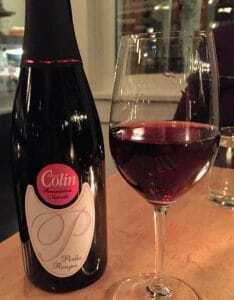 A few quick thoughts on the Patrice Colin Perles Rouges sparkling Gamay from Coteaux du Vendomois in the Loire Valley. Patrice Colin is an 8th generation winemaker whose family has been cultivating vines along the Loir tributary since 1735. Today Colin farms 25 hectares (62 acres) organically in the Coteaux du Vendomois VDQS of the northern Loire Valley. The Perles Rouges is 100% Gamay produced in the ancestral method or pétillant naturel (Pét-Nat) style. Compared to Champagne, the wine undergoes only a single fermentation with the wine bottled partway through. The yeast continue to ferment the sugars in the bottle, trapping the CO2, producing a lightly sparkling wine. Pét-Nats are rarely riddled to remove the dead lees sediment and can often be cloudy. They also tend to be dry with lower alcohol and no dosage added. However, the Colin Perles Rouges is riddled (remuage) and one tasting note from a previous bottling (back in 2012) does mention a Pineau d’Aunis dosage. Though my experience with the wine didn’t have smokey hints or candied fruits noted in that 2012 tasting. Patrice Colin produces around 150,000 bottles at the family domaine. The wines are made with low sulfites and are vegan friendly. The savory herbal notes of this sparkling Gamay remind me of the herbs used to make roasted chicken. Medium intensity nose. Dried cherries and cranberries with an herbal tinge. On the palate those red fruits carry through but taste more fresh than dried with mouthwatering high acidity coupled with the effervescence. Noticeably dry, there is some slight tannin texture to go with the fine mousse of the bubbles. The herbal notes become more define as savory thyme and marjoram. There is also a peppery spice that emerges for the moderate finish. This is definitely very different from most sparklers. While not as complex as a Cru Beaujolais, I can see the kinship with the Gamay variety. For $14-18, this is a solid and interesting food pairing wine–especially with savory meats like sausages or chicken. Tagged Coteaux du Vendomois, Gamay, Loire wine, Organic viticulture, Patrice Colin, Pet-Nat, Pineau d’Aunis, Sparkling wine, vegan-friendly.